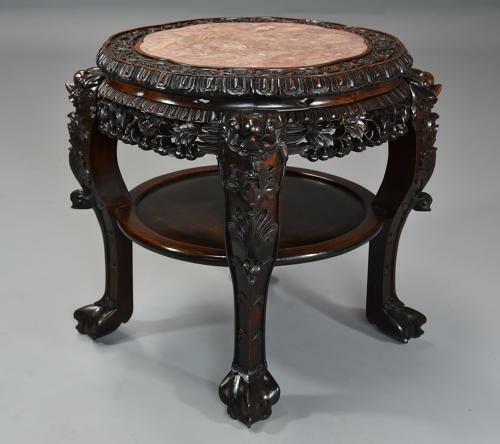 This pot stand consists of a shaped Chinese rouge marble top, this being recessed into the top surrounded by foliate and floral carved decoration with geometric carved design to the edge. This leads down to a deep moulding with a carved and pierced frieze below of foliate and fruit carving leading down to the legs. The top of the legs consist of a carved face of an open-mouthed dragon leading down to carved lotus flower decoration with carved foliate decoration below (the lotus flower being a symbol of purity and devotion), the stand is supported on cabriole legs leading down to ball and claw feet. This pot stand is in very good condition for age, is of stable construction and can go straight into a home - this is a very versatile piece and could be used as a stand, low table, coffee table etc.